At the end of the last trip I had 533 miles/857.5 km left to go so I needed a trip that would cover a lot of mileage. And I knew just the thing. I’d been dying to do this since the start – the very north edge of Scotland. 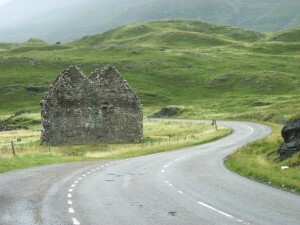 I really wanted to do the Bealach-na Bo pass to Applecross in Wester Ross. This is a very steep, hairpin pass which zigzags its way up a mountainside. You get to it by taking the A87 to the Kyle of Lochalsh then a series of single track and secondary roads which eventually come out at Ullapool from where I’d be able to continue on to the north coast. 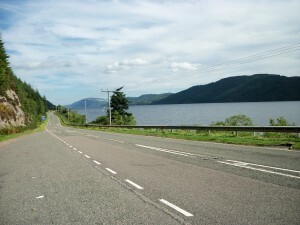 But it would add a lot of time to my journey and, as I’d done it before, years ago, in a car, I decided against it and to go straight to Ullapool via Inverness. This would reduce the trip to two days instead of three meaning I wouldn’t have to leave Cozy, my cat, alone for more than one night. It was still a huge distance to cover, so I was up at first light and on the road by 8.00 am. 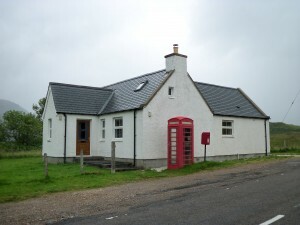 Straight up the A82 to Fort William, then on to Invergarry. This is where I could have turned west to Applecross but I continued straight on to Fort Augustus, where the Caledonian Canal meets Loch Ness. The canal locks were bustling with people but I didn’t stop and continued until the road started to run parallel with the Loch. I kept wondering where the spot was that that couple saw Nessie all those years ago. I was in Inverness by 1pm. This is where my map let me down as it wasn’t detailed enough and I had to ask a man in a car park how to get onto the Ullapool road. He gave me directions and, when I then pulled level with him at a roundabout, he pointed me to the correct exit. Over the Moray Firth bridge and I found the A835 which I followed all the way to Ullapool. 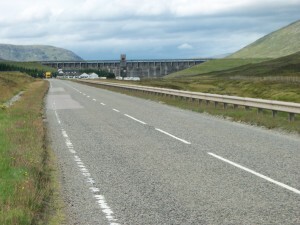 The A835 was a fabulous road – a nice, wide carriageway with no pot holes and well graded bends that required no reduction in speed. As I came to an impressive dam I pulled over to take a photo. God, it was so quiet. I couldn’t hear a thing. As I lined up my shot, suddenly, BANG, there was this almighty explosion as a Tornado jet rocketed across the sky. 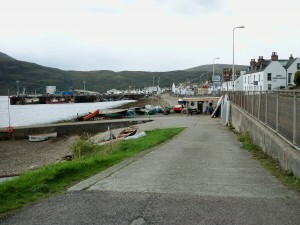 I reached Ullapool at 3 pm and had a quick break. The skies were clouding over and it looked liked rain ahead, so I went in search of something to eat. Fortified with chocolate and a cup of lentil and cumin soup (quite the oddest combination I’ve ever had) I headed for the petrol station. 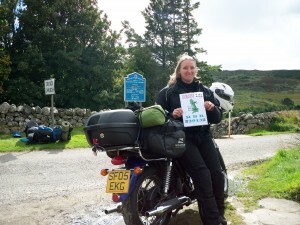 Here, I met a German lady who was also touring Scotland on a motorbike. She’d come with a friend but it seemed they’d had a parting of ways and she was now having the time of her life exploring every single track road she could find. After a few minutes cars started to queue up and the owner came out and gave us the evil eye. We wished each other bon voyage and I continued north as she went south. Riding up a series of narrow, winding, back roads through the hills and glens of Scotland’s north western coast was a true delight. It was raining but I didn’t care, it was breathtakingly beautiful. 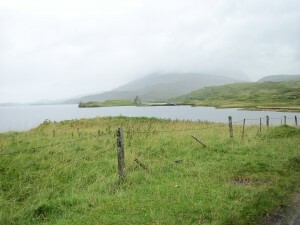 As I approached Durness, I saw a sign for the Passenger Ferry to Cape Wrath. Unfortunately, that was the closest I was going to get to that corner of the country as it was 4.30 pm now and, I suspected, too late for the last ferry. Reaching Durness, I was overcome with joy. 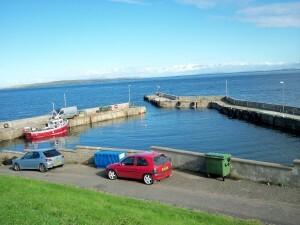 I had made it to the north coast of Scotland. I felt utterly elated. From here I decided to continue on to Tongue, a short distance on judging by my map. 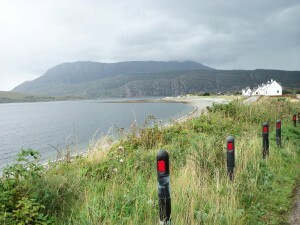 I didn’t look very closely though, as if I had, I would have noticed the road goes down one side of Loch Eriboll and up the other and adds an extra 20 miles to the journey. 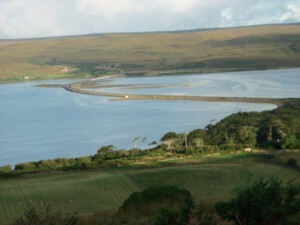 Coming into Tongue, the road crosses another inlet, the Kyles of Tongue, via a man-made causeway called the Kyles of Tongue crossing. I stayed in the Tongue Youth Hostel that night and got talking to an Aussie bloke called Phil from Moruya. By a remarkable coincidence, he knew Steve and Jan, the couple I’d met when doing my tour there in 2010/11. I was on the road for 7.30 am the next morning. The petrol station in Tongue didn’t open till 8 am but a sign informed me there was one in Bettyhill. I figured by the time I got there, this would be open. It was so tiny, I rode right past it without noticing it and had to turn round and have another go. 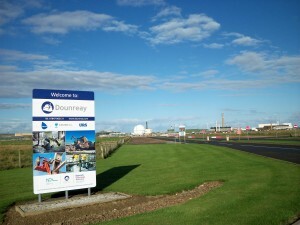 I continued along the coastal road, the A836, taking in the sights, when suddenly I saw what had to be Dounreay nuclear power station. It was in the process of being decommissioned but judging by the number of cars there this obviously involved quite a lot of people. 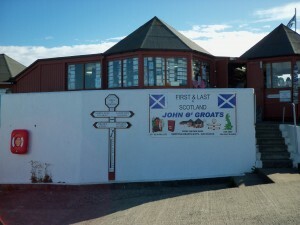 Next stop was John O’ Groats. Somehow I was deeply disappointed by this. It was just a car park really surrounded by a visitors centre and a few shops. After a cup of tea and a wander around, I got back on the bike and headed south. Travelling down the east coast, my mood became sullen. The wild, untamed, ruggedness of the west coast was replaced by a more cultivated environment of fields and organised villages. It was pretty but not in the same way as the west. 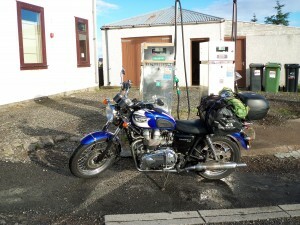 It was a long ride down to Golspie where I turned off the A9 onto the A839 to Lairg and on to Bonar Bridge and Ardgay. From here I went in search of the final landmark in the Round Britain Rally that I was participating in. Ten miles of single track road and I found the spot just as a group of school children doing their Duke of Edinburgh award arrived at the scene. One of their teachers kindly took a photo of me. Rejoining the A9 it was a long, cold slog, back to Inverness. I was cold, hungry and grumpy and I still had over four hours of riding to do. All I could think about was food. What I needed was a nice, hot stew. I was salivating just thinking about it. But there was no stew to be found so I had to settle for an egg mayonnaise sandwich in Fort Augustus and a pot of soup at the Green Welly in Tyndrum. I got home at 8.15 pm, just as it was starting to get dark. Going north, I had loved it, but coming south, it was a real trial to keep going. But I’d done it. I’d completed my 5,000 km (5,310.5 km/3,300 miles to be precise). Alas, I’d failed miserably to raise £5,000. But I’d seen Scotland in all its glory during the best summer we’d had in years, so all in all, it was a fantastic experience. I may have covered the 5,000 km I set out to do on this trip, but I haven’t raised anything like the £5,000 I hoped to, so if you’ve enjoyed reading this blog, then please MAKE A DONATION NOW by using the JustGiving link below. You can find out more about my “5K for £5K Challenge” here. Thank you. This entry was posted in 5K for £5K on September 6, 2013 by admin.